What’s the first thing that pops into your mind when you think about the sun? If it’s fear of getting skin cancer, you might not be the only one. While too much sun exposure can cause serious health issues, moderate amounts can be good for you – especially early in the day. Healthy sun exposure increases the brain’s ability to release a hormone called serotonin. Serotonin not only boosts your mood but also helps you feel calm, focused, and improves your sleep. Low levels of serotonin have been linked to a higher risk of seasonal affective disorder (a form of depression that is triggered by the changing season). In certain areas, wintertime can be quite dark and gloomy due to limited sunlight, which can significantly impact not only your mood but also your sleep. In order to fall asleep, your body temperature needs to decrease slightly. Instead of wearing thick PJ’s or dusting off the electric blanket, use proper bedding to keep warm this winter. Overheating during the night can cause you to sweat and experience an irregular sleep. But what if I told you, there’s a way to regulate the surface temperature of your mattress? Yep, no more sweaty mornings. Tip: Layer your bed with a sheet, lighter blanket, and a duvet. This way you can prevent overheating during the night by uncovering yourself as needed. Do you wake up with a sore throat and dry nose in the morning during the winter months? If you’re nodding your head right now, then we suggest getting a humidifier for your bedroom. This way, you’ll not only solve the dryness issue but also make your cold room feel much cozier. It’s a lot more comforting to snuggle up and watch movies when it’s cold, isn’t it? Don’t fret! You’re not the only one. But research shows that regular exercise helps people sleep considerably better. A 2011 study in the journal Mental Health and Physical Activity discovered that people who were more active fell asleep sooner and reported a better quality of sleep. So head out to the gym, pull out the yoga mat, go for a brisk walk or dance to your favorite tune. Staying active will make you sleep more soundly throughout wintertime. It’s easy to fall into the trap of devouring a sizzling, heavy meal to warm you up on those chilly winter days. But be sure to monitor when you eat these meals. Eating a large meal before bedtime isn’t good for your body, because it has to do some extra-work to digest the food, which can disturb your sleep. Tip: Move your heavy dinner before 7 PM, or go for something lighter like a warm veggie soup. Light plays a major role in your circadian rhythm. Unfortunately, the little light that’s available during wintertime is of poorer quality, which can make you feel tired much earlier than usual. Instead of hitting the sack earlier, try to use artificial light to lengthen the day. Tip: Consider using light bulbs that mimic the full light spectrum of the sun instead of the classic ones that emit harmful artificial blue light. Of course, the best light exposure you can get is outdoors. Try to spend time outside during the day to increase the serotonin levels in your brain. Even if it’s only for 10-15 minutes. Remember to apply sunscreen with at least SPF 15 or more when you go outside for longer than 15 minutes during the hottest time. Winter is right around the corner! 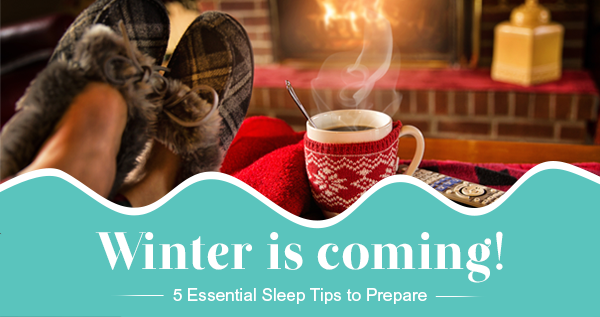 Try out these winter sleep tips to make sure you’re well prepared for the dark and gloomy winter months to come. Let us know, in the comments below, how they changed your mood, sleep, and your life. Oh, and check out these amazing sleep supplements Better Night’s Sleep Aid and Sleep Remedy. They can be a great alternative to help you enjoy a peaceful sleep. Get your sleep supplement now to fall asleep faster, for longer, and wake up refreshed!